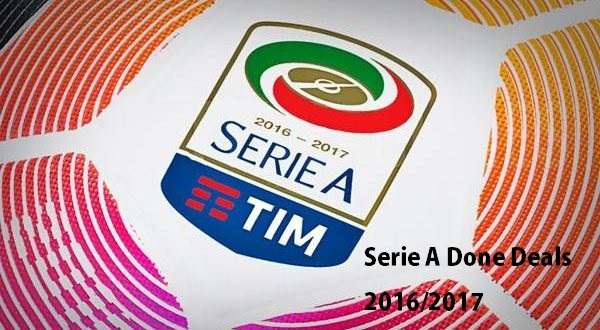 Serie A Done Deals 2016/2017 (Summer and Winter). See all the completed transfer of Italian league from top clubs AC Milan, Inter Milan, Juventus, Roma, Udinese. Check out all the important completed transfer so far in the Serie A 2016/2017, including the latest winter window deals. Defender Leonel Vangioni River Plate for free. Forward Gianluca Lapadula from Pescara for £7.5million. Defender Gustavo Gomez from Lanus for £7.3million. Midfielder Matias Fernandez from Fiorentina on loan. Midfielder Mario Pasalic from Chelsea on loan. Defender Kevin Diks from Vitesse for £2million. Forward Ianis Hagi from Viitorul for £1.6million. Midfielder Carlos Sanchez from Aston Villa on loan. Defender Hernan Toledo from Velez Sarsfield on loan. Defender Carlos Salcedo from Chivas on loan. Defender Maximiliano Oliveira from Penarol on loan. Defender Sebastien De Maiofrom Anderlecht on loan. Forward Cristian Tello from Barcelona on loan. Defender Hrvoje Milic Hajduk Split £0.84million. Midfielder Sebastian Cristoforo from Sevilla on loan. Midfielder Ever Banega Sevilla for free. Defender Caner Erkin from Fenerbahce for free. Midfielder Antonio Candreva from Lazio for £18.4million. Defender Cristian Ansaldi from Genoa for £5million. Forward Gabriel Barbosa from Santos for £23.5million. Midfielder Joao Mario from Sporting for £33.5million. Defender Dani Alves from Barcelona for free. Forward Simone Ganz from Como for free. Midfielder Miralem Pjanic from Roma for £25.3million. Midfielder Leonardo Spinazzola from Atalanta on loan. Defender Mehdi Benatia from Bayern Munich on loan. Forward Gonzalo Higuain from Napoli for £75.3million. Midfielder Marko Pjaca from Dinamo Zagreb for £20million. Forward Juan Cuadrado from Chelsea on loan. Defender Lorenzo Tonelli from Empoli for £8.3million. Midfielder Emanuele Giaccherini from Sunderland for undisclosed fee. Midfielder Piotr Zielinski from Udinese for £12million. Forward Arkadiusz Milik from Ajax for £31million. Defender Nikola Maksimovic from Torino on loan. Midfielder Amadou Diawara from Bologna for £12million. Midfielder Marko Rog from Dinamo Zagreb on loan. Defender Abdullahi Nura from Spezia for £2million. Forward Umar Sadiq from Spezia for £2million. Defender Juan Jesus from Inter Milan on loan. Defender Norbert Gyomber from Catania for £1.2million. Defender Moustapha Seck from Lazio for free. Forward Stephan El Shaarawy from AC Milan for £10.8million. Defender Antonio Rudiger from Stuttgart for £7.5million. Defender Mario Rui Duarte from Empoli on loan. Goalkeeper Alisson from Internacional for £6.2million. Goalkeeper Wojciech Szczesny from Arsenal on loan. Defender Thomas Vermaelen from Barcelona on loan. Defender Federico Fazio from Tottenham on loan. Midfielder Mohamed Salah from Chelsea for £13million. Forward Iago Falque from Roma on loan. Midfielder Adem Ljajic from Roma for £7million. Midfielder Sasa Lukic from Partizan Belgrade for £1.3million. Midfielder Panagiotis Tachtsidis from Genoa for £1.1million. Midfielder Mirko Valdifiori from Napoli for £2.9million. Defender Luca Rossettini from Bologna for £1.6million. Defender Lorenzo de Silvestri from Sampdoria for £3million. Defender Leandro Castan from Rona on loan. Goalkeeper Joe Hart from Manchester City on loan. Forward Stipe Perica from Chelsea for £3.3million. Forward Hamdi Harbaoui from Lokeren for free. Midfielder Rodrigo De Paul from Valencia for £2.5million. Midfielder Seko Fofana from Manchester City for £2.9million. Forward Adalberto Penaranda from Watford on loan. Defender Gabriele Angella from Watford for undisclosed fee. Midfielder Sven Kums from Genk on loan. Missed any important done deal? Comment and help us out!